Following the killing of Bin Laden last week, President Barack Obama’s popularity has soared. To a majority of Americans, the name Barack Obama inspires absolute confidence and security. And like Ernest in Oscar Wilde’s Importance of Being Ernest, the name Barack Obama has music of its own and produces vibrations. An excited American, Mike Jim, who spoke to The Post at the Zero Ground during the President’s visit on May 5, said: "It will go down into the history annals of this great country that Obama killed Osama, the villain of our times." Despite the avalanche of doxologies chanted for Obama, his Republican detractors are in a full-blown campaign to drown the tough-talking President in murky waters. Fox News is one of the media outfits in America that the Republicans are using to run down Obama. All their debates are tilted towards portraying Obama as an opportunist who is taking credit for killing the Czar of Al Qaeda. They claim that the killing of Osama was long designed by former President George Bush. Many hold that Obama’s only crime is that he is a democrat. Yet, the young and energetic President has gone tough, asserting his authority without paying the least attention to his detractors. He did so by using, in an unprecedented manner, the first person’s singular when he addressed the nation last week. Hear him: "And so shortly after taking office, I directed Leon Panetta, the Director of the CIA, to make the killing or capture of Bin Laden the top priority of our war against Al Qaeda, even as we continued our broader efforts to disrupt, dismantle and defeat his network." After listening to President Obama, observers are wont to warn that those who want to take away credit from him for masterminding the killing of Bin Laden are kidding. One could easily read President Obama’s ownership of Bin Laden’s demise when he announced the event in a strongly worded statement at the White House on May 2. He said: "Tonight, I can report to the American people and to the world that the United States has conducted an operation that killed Osama bin Laden, the leader of Al Qaeda and a terrorist who’s responsible for the murder of thousands of innocent men, women and children." He looks innocuous, somewhat laconic, yet each word that comes out of his erudite mouth is pregnant with meaning. 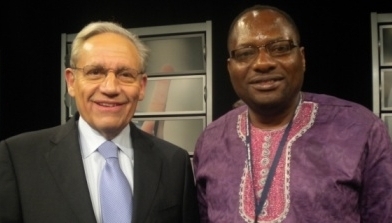 Bob Woodward’s name rings a bell. He is The Washington Post journalist who uncovered the Watergate Scandal that forced President Richard Nixon to quit the stage on a dirty slate. When it was announced that Bob had to make special remarks during one of the sessions on World Press Freedom Day at the Newseum in Washington D.C, young reporters went into rhapsody. The joy of meeting with the man, who gave a rampaging kink to Investigative Journalism, was overwhelming. And so reporters struggled to outdo each other in posing for photographs with the ace journalist who is now the Associate Editor of The Washington Post. Other speakers on the panel, including the Washington Bureau Chief for AlJazeera, Elena Foukara, an investigative journalist from Russia and Huma Yusuf, a journalist from Pakistan, agreed that the internet and other forms of modern media could be good sources for the traditional media. But bob Woodward went against the popular wind by insisting that human sources are still the best. "Reporters should always go to human beings to get the authentic story," he cautioned. In a pleasant analogy, he told the audience how an army general snubbed him many times but he finally got the story from him because of his patience and resilience. He emphasised that "the real story is not in the Internet but in the secret minds of witnesses." He condemned what he called "hurrying to press" and regretted that "what drives the media in America is impatience and speed." To him, the digital media do not give an in-depth analysis of events. "We need to bring our audience back to what happened," he advised. A group of foreign journalists who attended the event were so fascinated with Bob’s presentation. "Meeting Bob is one of the best things that has happened to my career," Walaa Hawari, a journalist from Saudi Arabia said. Abeer Jaafar from Iraq, Claudia Siles from Bolivia, Juan Sanz of Argentina and Spas Spasov, among other journalists, met the senior journalist and covered two major events in the US: celebrations marking the killing of Bin Laden and President Obama’s visit to Zero Ground in New York. They expressed gratitude to the Foreign Press Centre for enabling them visit the US at such an eventful time. The Global Conference that took place on this year’s World Press Freedom Day was sanctioned by the issuance of a blueprint document known as the Washington Declaration. The declaration calls on UNESCO member countries to enact and enforce freedom of information laws and provide adequate resources that permit everyone ways to access information held by governments and guarantee transparency of governmental activities. The journalists called on governments to "ensure a legal environment in which free speech is encouraged and is not penalised by onerous defamation laws." Governments were equally called upon to take prompt and effective action to assure the safety of journalists, bloggers and all those who express themselves on digital media platforms from intimidation, threats, physical attacks and attempts against their lives. They were urged to recognise and ensure that the same principles of freedom of expression apply equally to the internet and other new information technologies; as they apply to traditional forms of media among other issues. The declaration charged professional associations with the responsibility of promoting and supporting investigative journalism through training as well as raising awareness about the role of new media. Journalists’ associations were told to promote and strengthen forms of independent and voluntary self-regulation that enhance and support highly-quality ethical journalism and build public trust. Among other things, the journalists appealed to UNESCO to continue to promote and coordinate dialogue among Member States to ascertain the legal and human rights implications of social networks for freedom of expression, privacy and personal data protection. They called on UNESCO to sensitise Member States, public authorities, civil society and individuals about exercising freedom of expression through new media, and the importance of such media in democratic societies. During the event, the Director-General of UNESCO, Irina Bokova, awarded this year’s UNESCO Guillermo Cano World Press Freedom Prize to jailed Iranian journalist, Ahmad Zeidabadi.